Repairing corrupt SQL Server Database can be a tedious task if you don’t know the right technique. There is manual technique available to repair corrupt SQL database but a professional and authentic third-party software is always the best approach to do it. There are plenty of software available online for the purpose but finding the best one is again a big task. Before knowing about the SQL recovery solutions, you should know about SQL Server and reasons of its corruption. SQL Server is a database management system largely used for storing and retrieving data by other applications. Developed by Microsoft, SQL Server uses three types of files to store and manage data – Primary Files (MDF), Secondary Files (NDF) and Log Files (LDF). Primary SQL Server database files have .MDF extension. Each database has one primary file and it store user data and objects including Indexes, Columns, Views, Functions, Values, Tables, Keys, Stored Procedures, Triggers, Default Values, etc. MDF files also store the startup information for the database. Secondary files are optional and have .NDF extension. You can create unlimited number of NDF files as per your requirement. Commonly used to spread data across multiple disks, NDF files can be used to store user data as well. Log files are basically the backup files of SQL Server database. They are used to restore the database in case of corruption. Log files have .LDF extension and store log information. Every database has at least one log file. Hard disk failure, sudden power failure, unexpected system shutdown, virus attacks are some of the reasons that can cause MDF corruption. And, there are several other error messages you might get while trying to open a corrupt SQL database. If you’re a database administrator, you need to act immediately to prevent any kind of data loss. Read on to know the solutions to restore corrupt SQL database. There are few manual solutions to repair corrupt SQL database but they do not guarantee the database recovery. You can use the log files (NDF) of SQL Server to restore the database. However, log files are not sufficient enough to recover the database in many corruption cases. Sometimes, backup files also get corrupted if the corruption is severe. Another way to repair the corrupt SQL database is using the database console commands i.e. DBCC CHECKDB and DBCC DEBREPAIR. They can be useful to fix minor SQL database corruption issues but they aren’t very much efficient though for all corruption cases. And, performing database console commands require certain technical knowledge which might be confusing for non-technical users. Thus, using an authentic third-party software is the best way to repair and recover corrupt or damaged SQL Database. 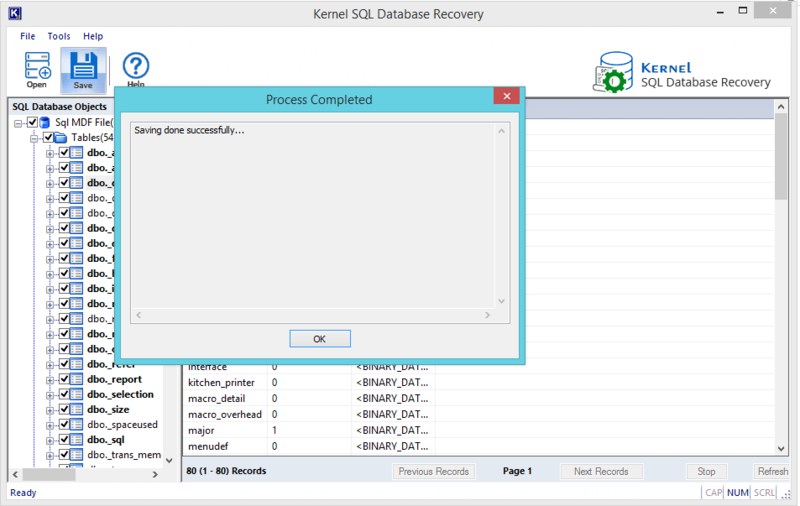 Kernel for SQL Database Recovery is the best software available to fix database corruption errors. 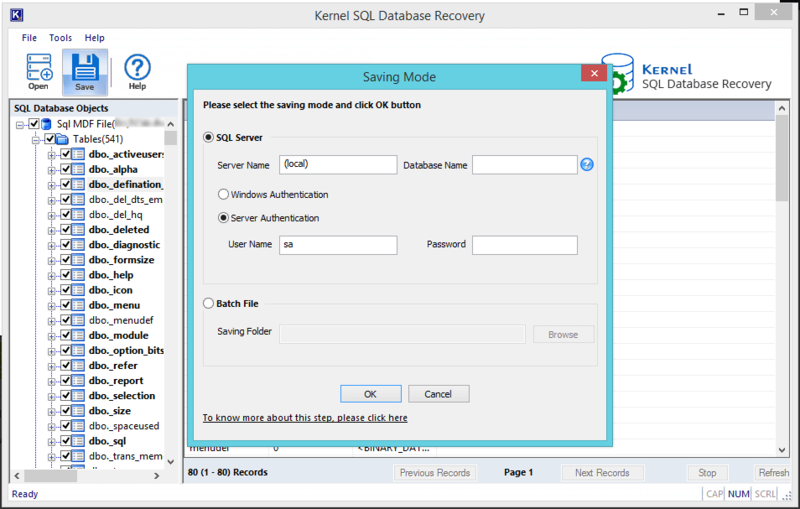 Kernel for SQL Database Recovery is probably the best software to deal with all kinds of SQL database corruption issues effectively. The software is extraordinarily programmed to fix all minor and major MDF (primary database files of SQL Server) file corruption issues with accuracy. Ensuring effortless database recovery in almost no time without making any data loss, the software offers some really high-end features. In fact, the good and most remarkable aspect about the tool is its ability to restore all SQL database objects including Tables, Columns, Indexes, Functions, Values, Keys, Views, Rules, Triggers, Stored Procedures, Checks, Default Values, User data types etc. Adding to that, it even provides complete support to restore multiple MDF files at the same time. No matter whether the size of database is big or too big, the tool easily repair MDF file of any size. 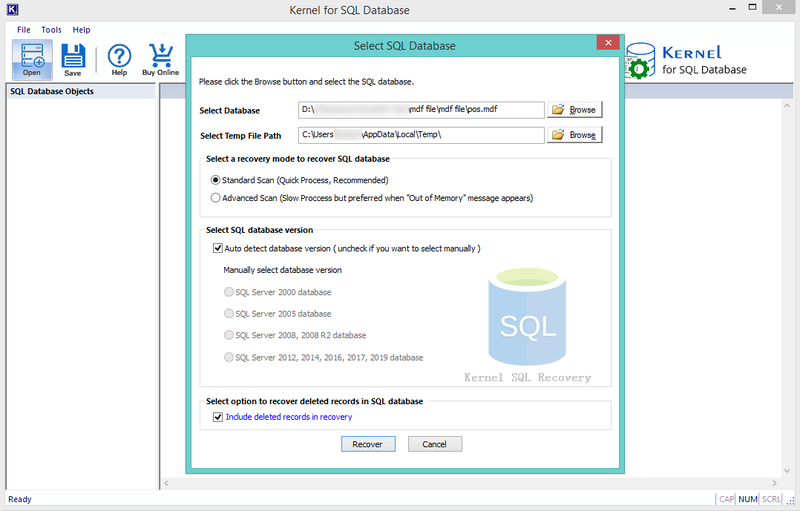 Step 1: Start Kernel for SQL Database Recovery software and click the Browse button to select database which you want to repair and select the SQL database version. Standard scan – A standard scan is useful for minor corruption. Advanced scan – Use advanced scan in case standard scan is not able to remove the error or the database is showing “Out of Memory” message. Step 2: After the scanning process, the software displays all the recovered database objects for preview before saving as shown below. Step 3: Hit on the Save button and choose one of the saving modes as desired and click OK. Step 4: Finally, your corrupt SQL database is repaired and saved successfully. Moreover, the tool has got SQL Server mode and Batch File mode to save the recovered objects directly in SQL Server and Batch file of recovered database respectively. And, the best part is its availability in free trial version. 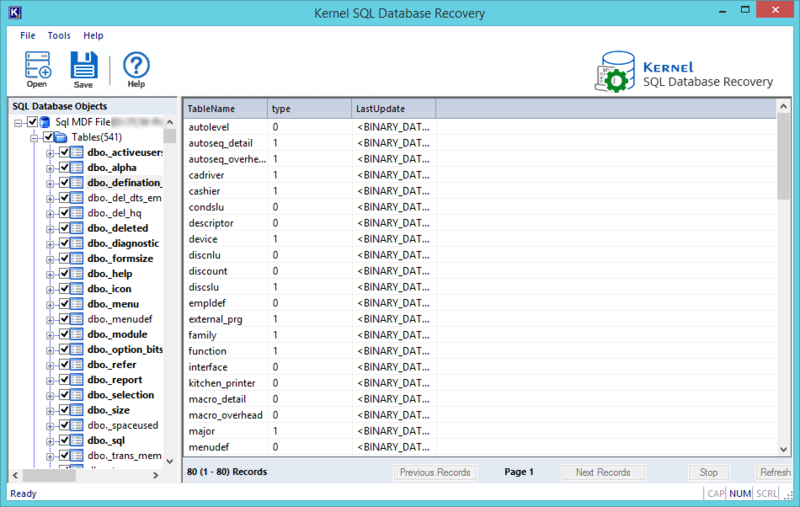 The trial version of Kernel for SQL Database Recovery tool is absolutely free. Trial version can recover the database objects but doesn’t allow saving, and so to overcome the limitation, you would require to buy the licensed version. How to Identify SQL Database Corruption? How to Rebuild and Restore Master Database in SQL Server? Hi, I got the error during SQL server Login “Microsoft SQL Server, Error: 18456”, Can you please help me? This error means, you may enter invalid credentials when logging into SQL Server. This is due to security reason to prevent unauthorized persons. To resolve Microsoft SQL Server, Error: 18456 you need to enable ‘SQL Server Authentication’.